An update on the Award Scheme: the next round of the Engaging Research Awards will be launched on 13 October 2014. Watch this space for further details. The OU’s inaugural 2104 Engaging Research Award Scheme is now closed. Select Award Scheme for the full list of seven winners. We will be running another round of the OU’s Engaging Research Award Scheme towards the end of 2014. We will announce the next round of the scheme through Associate Deans for Research and the Research and Career Development Team. We will also post information about the scheme on the OU’s intranet, through the Research Information Alert, and on this blog. The NCCPE’s Public Engagement Competition is now closed to entries. The date for the Awards Ceremony for this national scheme is 11th June 2014. Are you involved in public engagement with research at the Open University? Have you been involved in an engaged research project that you want to share? Why not enter the Open University’s inaugural 2014 Engaging Research Awards Scheme? The OU’s RCUK-funded Public Engagement with Research Catalyst team, ‘An open research university’, is running this Awards Scheme to find and celebrate high-quality public engagement with research at the OU. 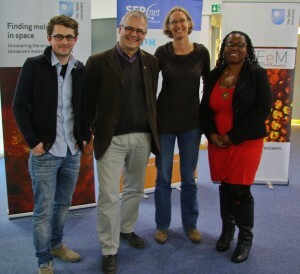 The OU Awards Scheme has been timed to connect with the first national competition to celebrate excellence in public engagement with research. Entrants to the OU Awards Scheme can use their entries to enter this nationwide competition. Select Public Engagement Competition for further details of the NCCPE scheme. Across the OU researchers are engaging with publics, user communities and stakeholders in lots of different ways and for lots of different reasons. Through this scheme we want to recognise and reward examples of top quality engaged research in practice, and we want you to get involved. A judging panel will shortlist finalists in three categories: Research Leaders; Early Career Researchers; and Postgraduate Research Students. The finalists will be invited to an awards ceremony at the Open University in Milton Keynes between 12.30 and 13.15 on 12 March 2013. Postgraduate Research Student, who should be currently registered to study for a PhD, either full-time or part-time, with the Open University. Entries under the ‘Research Leaders’ and ‘Early Career Researcher’ categories require sign-off from their Associate Dean, Research (or equivalent) prior to submitting their entry. Postgraduate Research Student entrants should have successfully completed their Probation Review. The activity must be an example of public engagement with research, as defined by the Awards Scheme. The entry could be of any size, length or cost. Applicants must be available to attend the awards ceremony at the Open University’s Walton Hall campus between 12.30 and 13.15 on 12 March 2013. Closing date for applications: 14th February 2014 at 5pm. Late entries will not be accepted. We will only accept entries that are made on the online form. The intention(s) should be clear, engaging publics, user communities and other stakeholders in meaningful ways. Providing innovative public engagement with research opportunities to effect change or mutual benefit. Contributing to positive change with respect to public engagement with research practice, policy or procedure. Illustrating an engagement in professional development activities. Demonstrating quality and critical reflection through effective evaluation of the activities.